The “castles in the air” are your dreams, your aspirations, your goals. They should be bold, grand and perhaps a little bit outrageous. They should be something worth striving for, something that gets your heart racing. They should truly be castles, not shacks or cottages. But of course, bold dreams aren’t enough without action. You still need a plan and you still need to start building. President John F. Kennedy had a castle in the air dream of placing a man on the moon and an amazing team of people worked hard to make it happen. Martin Luther King Jnr had a castle in the air dream of racial equality and while there’s still work to be done, his generation have made significant progress in this area. 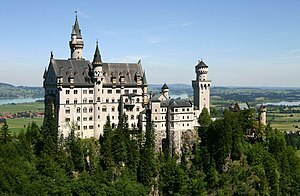 Bill Gates had a castle in the air dream of a PC on every desk that drove him and his company to phenomenal heights. Almost anything of significance that has happened over the years has happened through a bold, ambitious vision that’s been followed up with a carefully and diligently executed plan. What’s your castle in the air? And what are you doing today to lay the foundation for its completion? I am writing my head and fingers off, Darren, towards completion of an adult fairy tale/allegory based on scriptures common to all the world’s major religions. I am converting my year’s worth of dream images into illustrations for this series. I am daily learning from, and supporting,many other blogging writers from around the world to build the foundation for my castle. My dream is to trigger touchpoints of connection in folks around the world who were previously enemies. That’s a big castle granbee. Keep building! Thank you for the inspiration and pushes too, Coach D!